How do you start a world-class jazz center on four dollars? As the Kuumbwa kicks off its 30th anniversary celebration, its story can finally be told. Rev: Go Enduro: The body has a stripped-down, almost skeletal look. Basically, they look like giant insects. A Trio by Any Other Name: Timothy Baker lucked into use of the name Amadeus for his trio--and has used it as a springboard into international renown. The Rock Show: Flogging Molly. Stranger in a Strange Land: Our resident vegetarian boldly takes on the final frontier--steakhouses--and Peachwood's comes out on top. Please don't forget to write! Metro Santa Cruz welcomes letters. Like any great work of art, they should be originals -- not copies of letters sent elsewhere. Include address and daytime phone (for verification purposes only). Letters may be edited for length and clarity or to correct factual inaccuracies known to us. 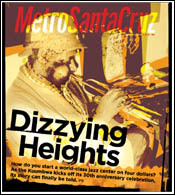 Postal: Metro Santa Cruz Letters, 115 Cooper St., Santa Cruz, CA 95060. Fax: 831/457-5828. Emailers, please include name, city of residence and phone number. Letters printed will list email address unless otherwise specified. Letters to the editor are not currently published in the online version of this paper.